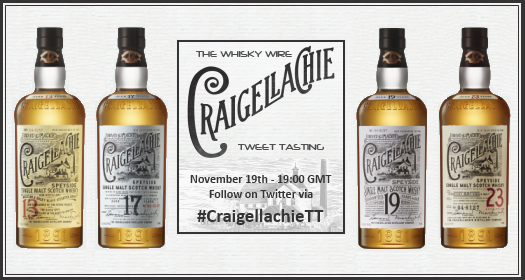 Continuing our triumphant teeming throng of Tweet Tastings, we’re absolutely thrilled to announce that on November 19th, we’ll be sharing, sipping and savouring a swathe of Speyside whisky wares from the Craigellachie distillery. On the night we’ll be pouring and exploring our way through Craigellachie’s 13 Year Old, 17 Year Old, 19 Year Old (travel retail exclusive) 21 Year Old (cask strength - bottled for the Craigellachie Hotel) and 23 Year Old expressions. We’re also delighted to announce that on the night we’ll joined by Stephen Marshall, Bacardi’s Global Marketing Manager for single malts, who’ll not be tweeting in on the action but on hand to answer your questions on the night. Selected tasters will also receive a copy of the new Craigelllachie distillery book, written by whisky expert and all round great guy Dave Broom. The closing date to register is October 30th, and if you are registering to take part please make sure that you will actually be free on the night!! !